Good decisions, attention to detail and faithful restoration have rejuvenated the Arts Centre’s Clock Tower, earning it a top heritage award. 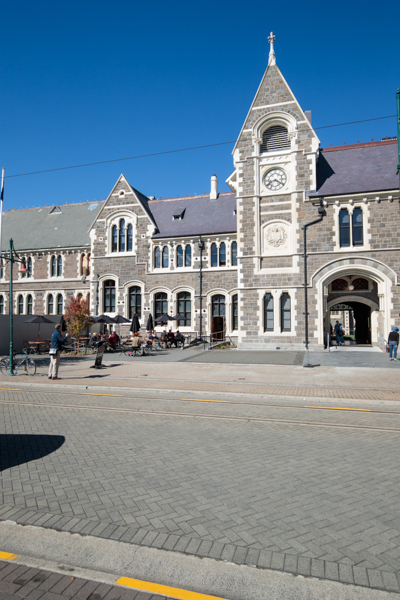 The restored and fully strengthened building – which houses the Rutherford’s Den science museum and shop, Bunsen café and the Arts Centre administration offices – rose above 35 other finalists to win the 2018 Supreme Award at the biennial Box 112 Canterbury Heritage Awards in June. The 141-year-old Benjamin Mountfort-designed tower also won the Public Realm – Saved and Restored Award category, a category the centre’s Boys’ High Building was also commended for. The centre’s restored Great Hall took out the Supreme Award in 2016. Awards chair Dr Anna Crighton says the four-storey tower’s revival was “one of the most significant heritage restoration projects of Christchurch’s post-quake recovery”. This award is one of seven the restored Arts Centre buildings have received, including a 2017 UNESCO Asia-Pacific Award for Cultural Heritage Conservation. Led by the Arts Centre, Warren and Mahoney Architects, Fletcher Construction and Holmes Consulting, among others, hundreds of workers poured thousands of hours into the Gothic revival style building’s rejuvenation. It reopened in 2016 with more than 10,000 of the public pouring in its doors. While the Arts Centre restoration has passed its halfway point, the charitable trust behind it is actively fundraising to bridge the substantial shortfall in funds to complete the project. To support the rebuild, visit artscentre.org.nz/support.